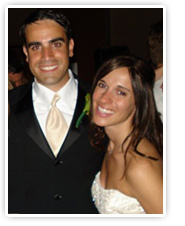 Susan Alexander Shapiro and her husband Mark were inspired to start BravoBride when they were shopping for their wedding. Susan was tired of overpaying for brand new wedding items she'd use only once and then stuff into the closet. She wished there was a way to buy and sell new and gently-used wedding items, a place where she could find what she needed without spending a fortune and get some money back on her wedding. And so BravoBride was born. We're proud that on BravoBride, you can find virtually anything you need for your wedding, new or pre-owned—from dresses, jewelry and accessories to ceremony and reception items and more—at terrific prices. But we think what makes BravoBride really special is how it allows you to give back. When you shop at BravoBride, you're passing along items you no longer need to someone who will one day do the same. That's an Earth-friendly way of doing business you can feel good about. You're also making a stand for women's health when you buy and sell on BravoBride—we donate a portion of our upgraded listing fee proceeds to the American Heart Association's Go Red for Women Campaign to reduce heart disease among women. So welcome to BravoBride the smart choice for an unforgettable wedding. We think you're going to enjoy shopping with us. Visit our Get Started section to find what you need or begin listing your items today.